This bag design sits alongside the Sour Cream & Onion and Regular Chips in a range separate from the fancier flavors, such as Baby Back Ribs. However, because they are standard flavors does not mean it was a good idea to put them in old fashioned, standard bags. Little effort has gone into changing this design, which is very much Herr's decision if they want to compete with other big name brands. These thinly cut Potato Chips had a fairly uniform and regular crispy bite. The broken oil bubbles and oily surface made them a little easy to crunch through. The plain and unexciting bag is followed by fairly plain and regular looking Potato Chips. There is some seasoning, some oil, and some natural brown areas on some of the Chips. 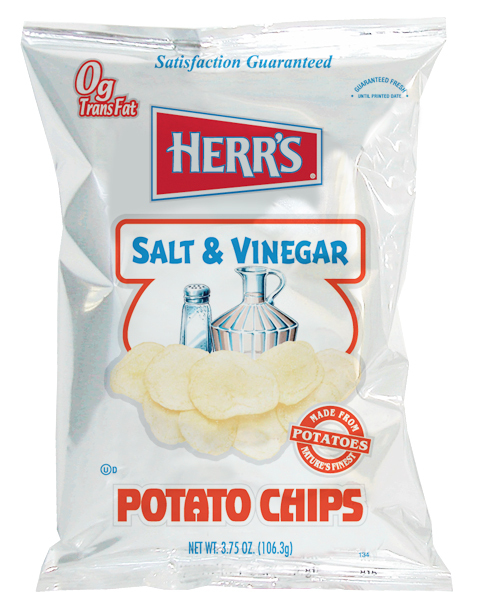 The Salt and Vinegar powders, along with the oil made a finger licking salty treat after the bag was emptied. When looking at the Nutrition Chart on the reverse of the pack it mentions 2g of sugar per ounce. This seems a little odd - very few other manufacturers need to add sugar content to their Salt & Vinegar flavor. The Nose Plunge Test featured a pretty vinegary aroma, which was matched by the taste. Despite having a relatively high salt content, these were certainly on the vinegar dominance side. A closer balance would have been preferred.